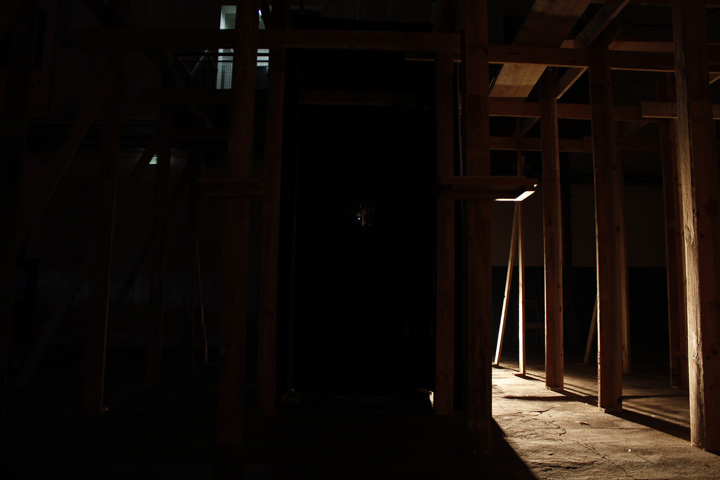 The project André Gonçalves has created for the space of the Curatorship Laboratory of Guimarães – 2012 European Capital of Culture had to deal with a constraint which no other artist featured in EMPTY CUBE has had to face until now. 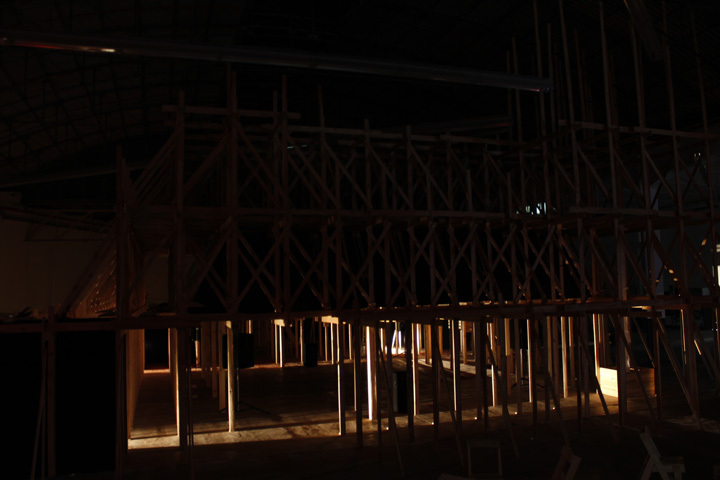 André Gonçalves’ work was carried out within the concepts and premises that make up EMPTY CUBE as an artistic and curatorial project, but without the physical presence of the cube, the modular space to which every project so far presented here has had to conform. 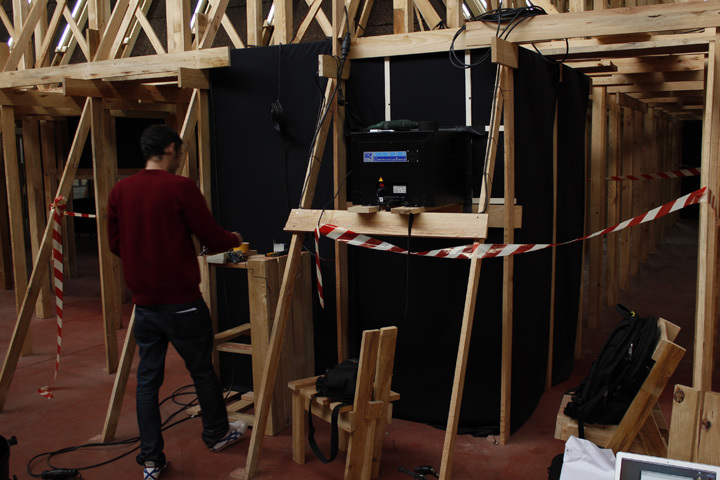 The working process found its starting-point in pictures of an ephemeral construction, built by a collective led by Alex Roemer / constructlab / EXYZT and installed at Fábrica ASA (Cova, Guimarães), a space in which the Curatorship Laboratory’s actions are held. 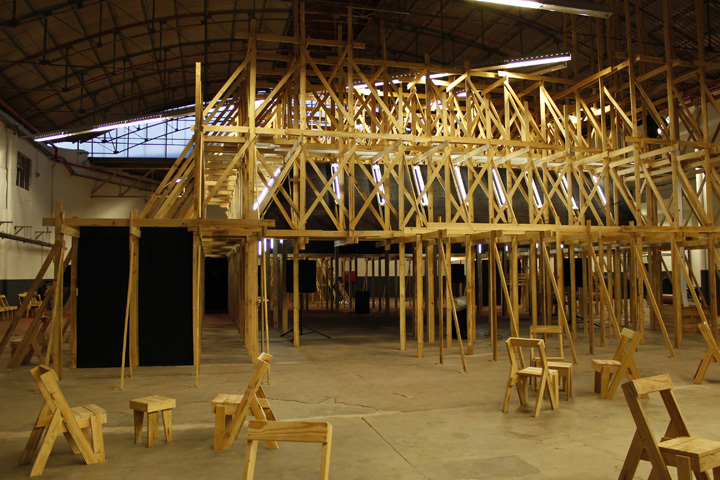 Then, André Gonçalves went to Guimarães to work as an artist-in-residence, developing in loco his project, ‘Exercícios de estilo’. André Gonçalves appropriated the structure, which is constructed in two different ways to achieve interaction with the viewer. 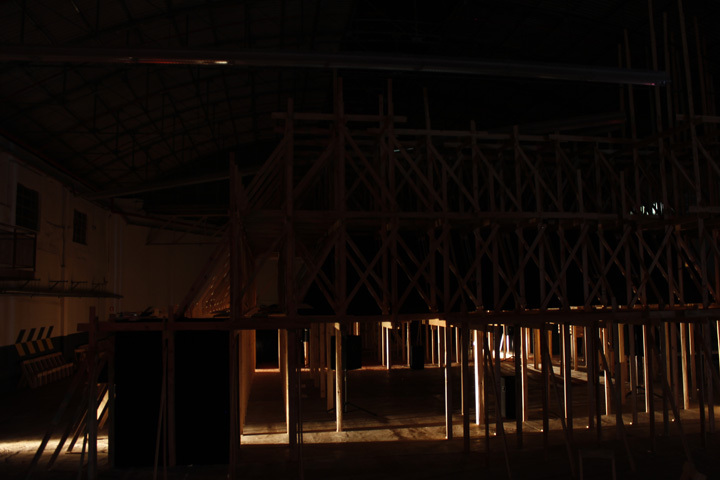 The first way does so via a selection of structural elements from the construction, which are the source of the graphic modules used in the three videos shown on TV screens, while the second occupies three corners of a rectangular construction containing black flannel-lined ‘cabins’ (similar to little black boxes), inside which visitors could view the videos in an immersive environment, while at the same time being able to gauge the structure’s space by means of its outer limits, glancing from one corner to the other in order to be able to see the image in the next video. 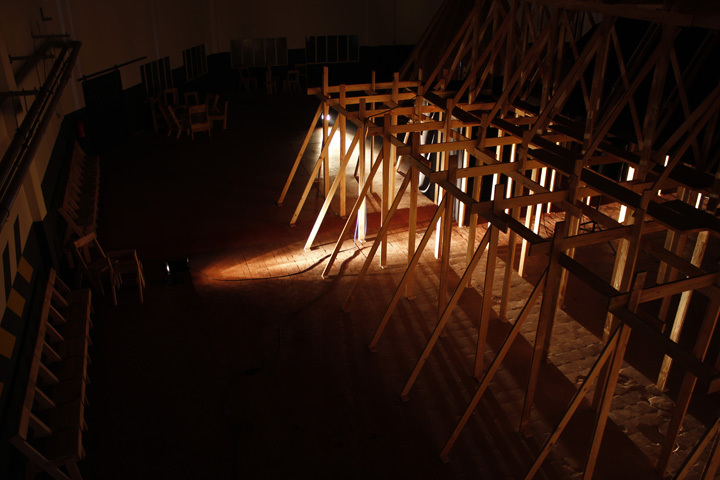 This topographical relationship with space was temporally recontextualised every four minutes, when the videos were suspended and replaced by the full lighting of the built space from the outside, via stage projectors, creating a nocturnal, spectral scenography of the structure, inside which a shadow-generated square could be found, its suggestion of the basis of a cube evoking the physical space of EMPTY CUBE. 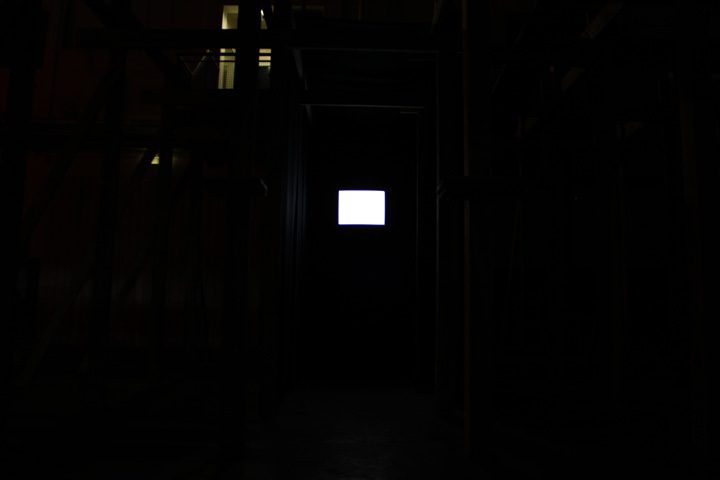 The three videos shown inside the black boxes, entitled “Exercício 1”, Exercício 2” and “Exercício 3”, shared one common element: a red dot that guided and focused the viewer’s eye during the projection, generating a near-hypnotic temporal and visual suspension, since a field of vision focused on a single point creates an illusion of parallax, as if the viewer were continually in the same apparent position regarding the sequence of objects on the screen. This triggers an optical phenomenon: the momentary retention of a pre-existing image, like a retinal memory that persists on top of the manifestation of a new object, leaving the viewer suspended between immediate visual memory and suggestion. This work by André Gonçalves is like an exercise on perception, since the induction of images recontextualises, in the viewer’s mind, the visual memory of the space and its retinal memory, during the brief moment of its duration. 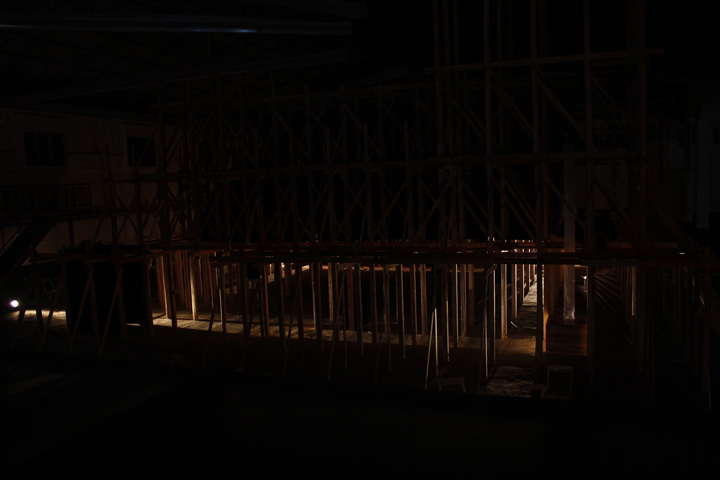 This very short-lived project amounts to a performance put on by the structure itself and its perenniality, in the sense that the existing space has been transformed into another space, as if the event itself were being edited in real time.